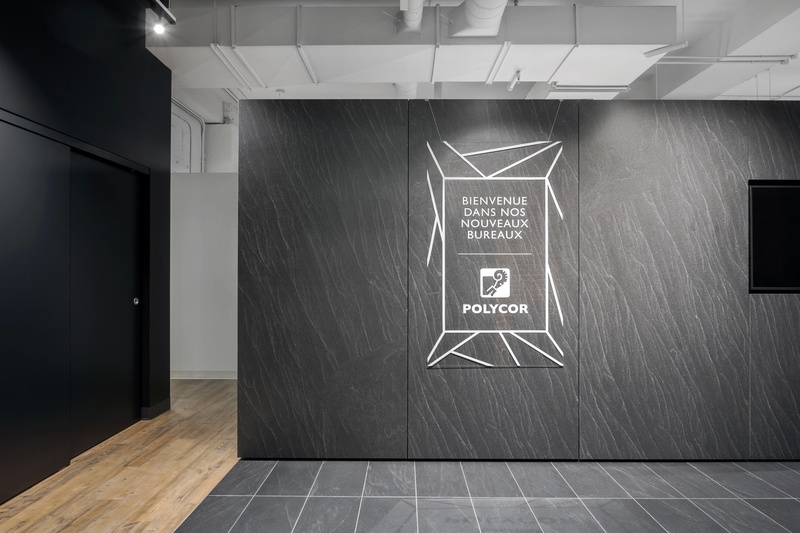 When space got tight at Polycor’s Quebec headquarters we knew two things, that we wanted to stay local, and that we wanted our space to be a gallery of all of our favorite natural stones that we quarry in the US and Canada. The move to our new headquarters was only right next door to our former space, and yet a world away in terms of how we could use design to influence how our team works. This year marks our 30th anniversary as company. Since our founding in 1987 we’ve become the largest fully-integrated manufacturer and distributor of natural stone in North America. 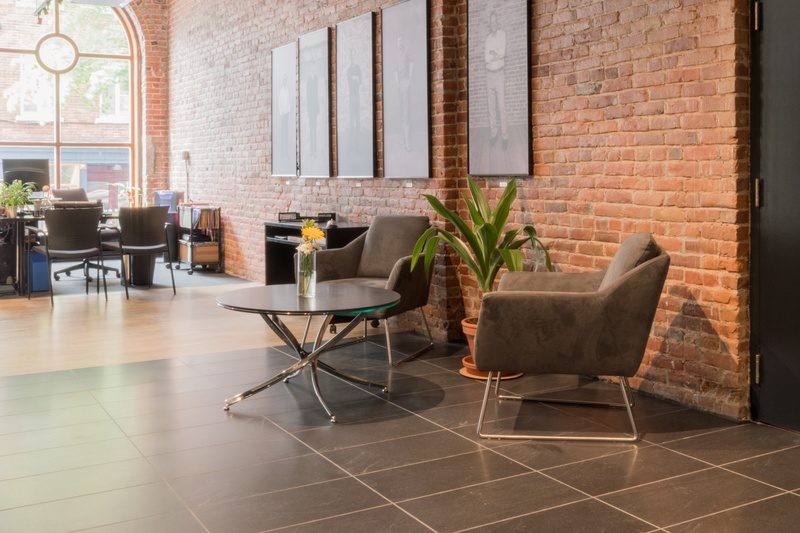 It’s been the dream of our President Patrick Perus to inspire the world to fall in love with natural stone, and this office is an extension of our company’s passion for North American stone. The open floor plan of the new space and it’s relatively unfinished interior was an invitation to create something uniquely suited for the Polycor team, both in design and in materials. In the words of our V.P. of Human Resources, Nancy Proulx, “Our aim was to create an environment where employees are happy and proud of their company, a place where we could welcome clients and have it be a reflection of who we are.” From the kitchen, to the reception area to the workstations and lounge, we used different finishes and cuts of our granites, marbles, limestone and soapstone to give each a defining characteristic and draw attention to the texture, tones and moods of natural stone. The layout and floorplans were important factors steering the concept. “The new office is designed with an open, flowing configuration that provides a collective space drawing cultures and teams together more closely like a family, facilitating the collaborative process,” Nancy says. And the finished design does just that while also showing off the heart and soul of Polycor. Take a virtual walk with us through our new offices. Photo credit: Dave Tremblay See more at Arch Daily. In September 2016, Polycor acquired Rock of Ages and Swenson Granite, two major American companies which brought us one of our newest colors, American Black granite which you see here in our entryway. 1 cm ultra thin slabs were used for the feature wall and large format tiles in a honed finish were used for the floors. 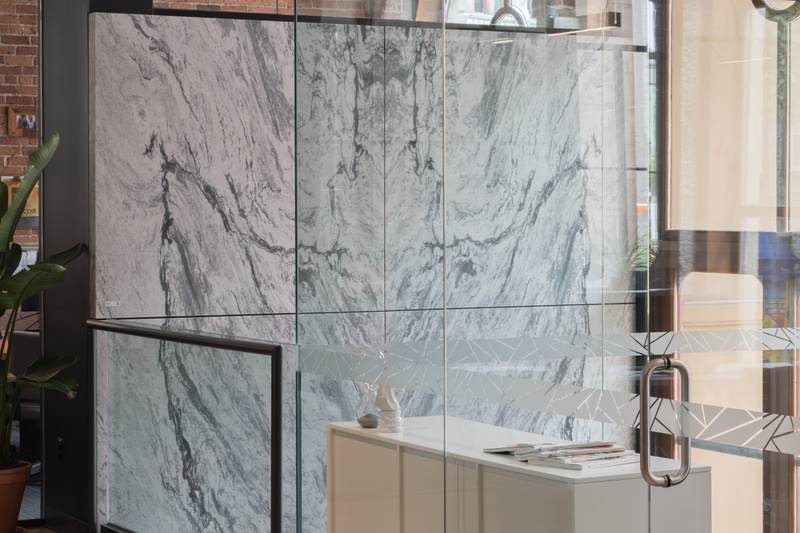 We’ve always believed that the vein patterns of natural stone are a work of art, and here in this glass walled office we showcase it’s beauty for all in the company to enjoy. The feature wall is built with 1 cm slabs of Pearl Grey honed marble from Georgia. The lighter weight allows for easier installation using Polycor’s Eclad 1 system. Fabricating furniture from natural stone is a craft we’ve recently fallen in love with. 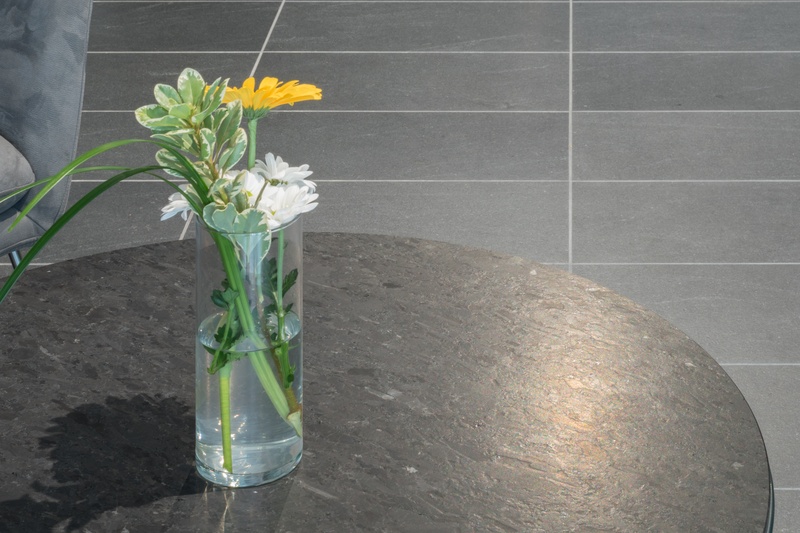 Here, in the entryway tables, you can see how the crystal structure of Saint Henry Black granite is revealed when the stone is antiqued, The deep color and pronounced texture pop against the soft black of the American Black honed granite tiles. 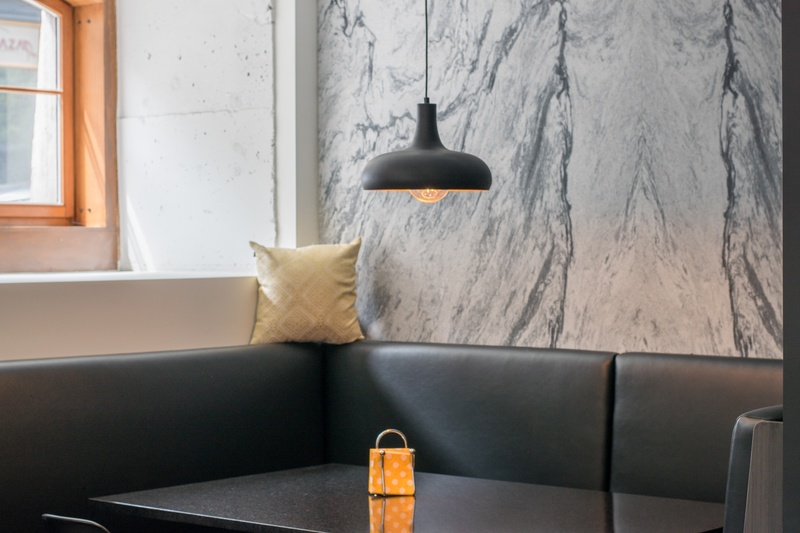 The dark veins in the bookmatched Pearl Grey honed marble slab walls in the dining area provide a dramatic backdrop for a banquette surrounding a Cambrian Black Polished granite table. Why use one countertop material in the kitchen when you can use three? We played with our black, white and grey palette in the kitchen using Saint Henry Black antiqued granite on the ends of the kitchen island, joined with Saint Clair Fleuri limestone in the center. 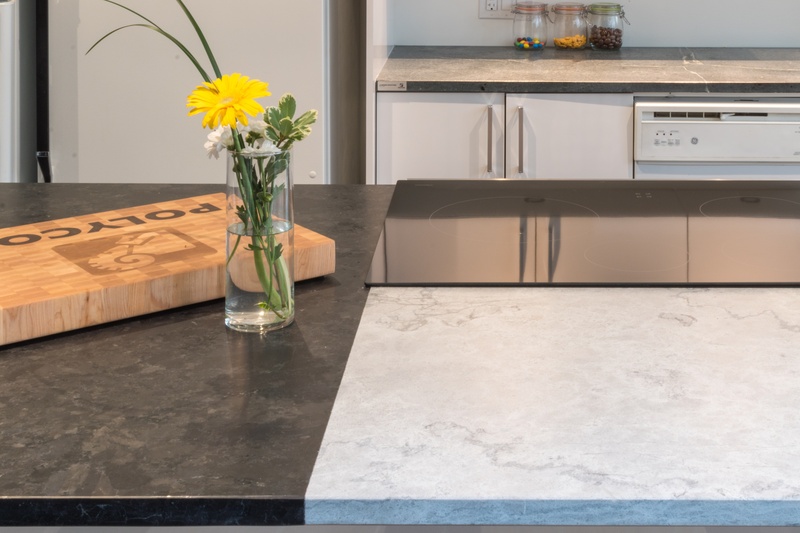 Perimeter countertops feature honed Alberene Soapstone. Natural stone’s versatility of textures and ability to enhance your experience of a design is unmatched among building materials. 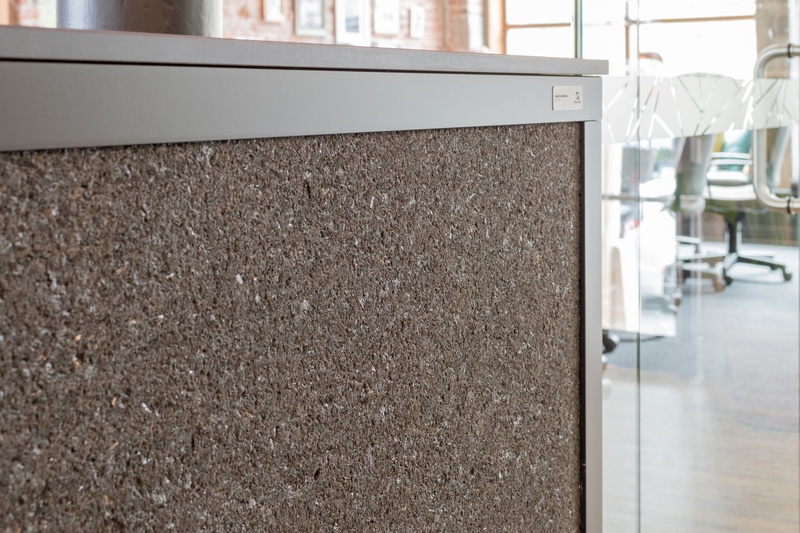 Here half walls of Cambrian Black granite with a waterjet finish create a surface that begs you to run your fingers over as you walk to a meeting in the conference room. Even after 30 years in the business we never get tired of the process of designing with the natural stone, from choosing a unique block in the quarry to finishing it with a texture that enhances the mood of a space, It’s a merging of craftsmanship and artistic expression with the variations of a natural material that make the natural stone industry so compelling. And with this new space and all it’s touchable surfaces, we’re ready for the next 30 years. Love natural stone? Get to know our newest color.